Owen, originally uploaded by bill kralovec. 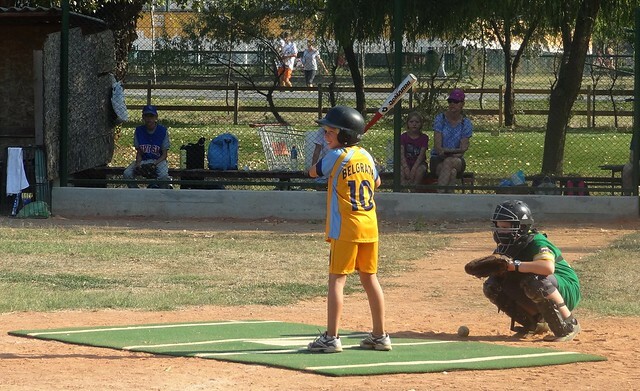 We played yesterday in the Tenth Belgrade Trophy Little League Baseball championship held at Ada Baseball Field. My friend Brian and I are coaching our sons and other international school students this summer. We got a team together to play some exhibition games in the tourney. We played “The Alligators,” Novi Sad, and Bešereck, finishing with 1 win and 2 losses on the day. 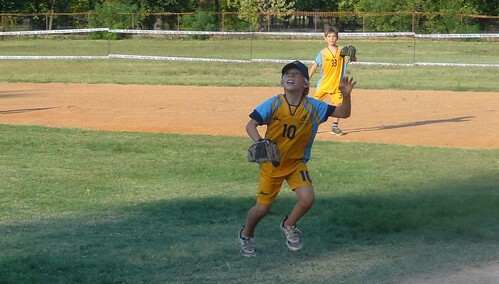 Owen made a couple of nice plays at first base and had a several hits, including a 2-RBI double to seal a victory against Bešereck. I would like to thank Nikola Vučević, the organizer of the tourney and head of the Serbian Baseball Association for inviting us to play! He went out of his way to give our kids opportunities to play on the beautiful field and have some real games. Owen and his friends were so excited to wear uniforms (the old ISB MS volleyball uniforms) and compete. The day was funded by the city of Belgrade. Despite the heat, it was a wonderful day. The first game we used a pitching machine against a much older team, and we soon found out we needed to switch to coaches pitching. In the second game we played against a team closer to our age, and in the third game, we played against a very good older club. Owen thought the highlight was Cody’s inside the park grand slam. With temperatures over 100F, after the game we cooled off in the river and had a nice BBQ meal at one of the restaurants at Ada. We hope to play some more games before the cold weather sets in.